Car dealers look for CRMs that allow them to manage incoming leads, connect with prospects and help them to stay on top of follow-up tasks. They should also be mobile ready so that salespeople can access critical information when they are on the lot or away from the desk. While automotive-specific CRMs offer industry features like dealer management system (DMS) integrations and vehicle identification number (VIN) scanning, we also considered general use CRMs that were able to combine business processes. We believe that Selly Automotive is the best car dealer software for internet lead management and overall contact relationship management. We arrived at this conclusion based on the criteria above due to its sleek mobile user interface and dealership management system integration. However, it is not an all-in-one solution. Luckily, Selly Automotive also offers a free version of its mobile app you can also use with other, general use CRM software like Zoho. Zoho gives you the ability to manage everything from sales, service, marketing and billing all from a single tool. Best of all, it is free for up to three users, giving you to run more of your business operation for less than an automotive-specific CRM. Selly Automotive is an automotive CRM and internet lead management tool supporting up to nine users and is the most economic automotive-specific option we compared. It offers a super clean mobile app, includes integrations with DMS systems, inventory management, follow-up appointments and lead insights for as little as $50 per month. There is also a free “lite” version of its mobile app, making it a great low cost, easy-to-use, automotive CRM with industry basics. Selly Automotive offers three different pricing plans based on the number of users starting at $50 per month for a single user, $99 per month for up to three users and $250 for four to nine users. Voice and text messaging services can be added on for an additional $30 per month fee. Selly Automotive includes work plans, appointments, email integration, follow-up automation, lead management and works with several major DMS systems, which is a feature not offered in general use CRMs. 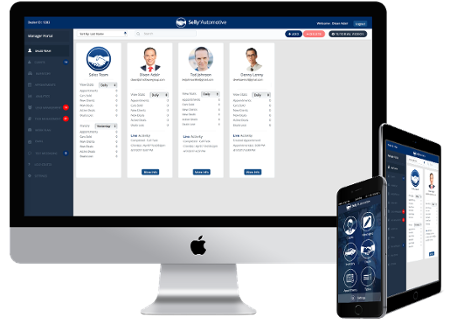 In addition, it comes with management view dashboards, an easy-to-use mobile interface with VIN scanning and its unique and patented Selly Notes Pop Up, which gives you prospect insights at a glance whenever a lead calls in. Selly Automotive works with lead sources such as Autotrader, CarGurus and TrueCar. With the additional $30 add-on for voice and text, which is opt-in compliant, teams can send text messages directly from the desktop or mobile user interface. The tool also comes with internet lead analytic tools and dashboards, which can help you determine the rate of return as well as measure the effectiveness of mass market, print mailer, email or social media campaigns. Selly Automotive gives users the ability to add fresh ups, track follow-ups, create customized work plans and assign automated tasks. When a lead calls in, its patented Selly Notes Pop-up screen displays lead information automatically. In addition, Selly Automotive lets you set up automated replies to internet leads, and you can set appointments or manage automated tasks within the tool. Selly Automotive gives United States-based dealerships access to their VINFactor Market Intelligence tool, giving dealerships pricing insights based on a VIN number. In addition, Selly Automotive gives users the ability to sync inventory from your DMS or pull CARFAX, AutoCheck or CARPROOF reports and works with several major DMSs like AutoManager, Frazer DMS, Wayne Reaves DMS and Skywerks DMS. Selly Automotive’s mobile tool is supported on iOS and Android devices, giving you the ability to respond to leads on-the-go and features its Notes Pop Up technology. It also offers a free “lite” version of their mobile app that can work with other car dealer software programs using XML and auto-lead data format (ADF) and add fresh ups or trade-in information with license and VIN scanners quickly. Selly Automotive is a sales-centric tool and does not include tools designed for dealerships that have a service department in addition. The tool also does not offer desking tools like ProMax nor does it contain features like social media integration, email marketing campaigns, order or invoicing management tools like Zoho does. Therefore, additional software is required to manage your dealership fully. Users of Selly Automotive say the tool is simple, easy to use and has great customer support. They also like the price, but say customization is limited and wish it could connect with WordPress sites. Selly Automotive is a desktop and mobile app designed to give small and independent buy here pay here (BHPH) dealerships a means to manage their internet leads, speed up data entry with license and VIN scanners and automate the follow-up process. At a cost of $50 per month for a single user, it is also one of the more competitively priced CRM tools exclusively focused on car dealerships. Visit their website to learn more or download their mobile app for free. ProMax is an automotive CRM that includes internet lead tracking, automated follow-up, desking, inventory management, marketing and DMS system integration. ProMax’s software can match prospects with the right lender automatically and offers tools for finance and insurance, which helps salespeople overcome objections and close deals quicker. Therefore, It is best for dealerships that don’t have a service department but do offer financing options. ProMax offers their CRM and desking software separately or bundled together. ProMax does not advertise its pricing publically and, because it is one of only three resellers of credit reports for all three credit bureaus in the U.S. auto industry, pricing may be subject to change based on fluctuations in the costs of those products. ProMax is an award-winning automotive CRM with DMS integration and gives dealerships the ability to track leads from multiple sources and send e-brochures, text and email follow-ups without leaving the tool. Its desking software also gives users access to retail and leasing tools, subprime lending options and financing and insurance tools as well as department of motor vehicles (DMV), power of attorney and disclosure forms for all 50 states, which is a feature not available on other CRMs. ProMax is a certified lead management provider for all major automotive original equipment manufacturers (OEMs) and can be configured to your sales process and accessed on either a desktop client or with the mobile app. Users can assign leads to specific salespeople or use a round-robin system, and it also has built-in duplication prevention, so you don’t wind up paying for duplicate leads. ProMax gives you the ability to set up automatic alerts as either text messages or emails to let you know when salespeople have not responded to leads within a certain timeframe. These alerts can also be set up to trigger only during store hours. ProMax also gives you the ability to set work plans, which creates daily tasks, mass emails campaigns and prints scheduled letters. ProMax includes VIN decoding and book out, working with National Automobile Dealers Association (NADA), Kelley Blue Book (KBB) and Black Book. It integrates with virtually all DMS systems, adding and removing vehicles daily while also providing access to open recall data for all OEMs. In addition, the tool can send inventory updates to third-party sites like Autotrader and Cars.com and update your website automatically provided you are using a ProMax website. ProMax’s desktop and mobile apps let users can also sort and filter inventory data from your lot or by other lots in your group and includes VinScan, EZ Up and Driver’s License Scan log ups from anywhere. It is supported on all web browser, tablets and smartphones with no additional setup required. ProMax does not include more robust appointment setting tools or the service ticket management DealerSocket offers. 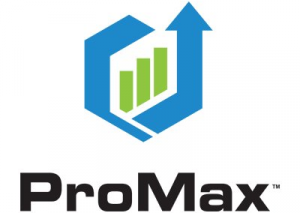 Users of ProMax report the tools are regularly updated and customer service support is always available. However, they would like the ability to customize it more. The tool gives users the ability to combine the desking, actual cash value (ACV) and compliance into a single program rather than require them to buy multiple software products and like the built-in reports, but say the user interface, itself, feels clunky and outdated. ProMax Automotive CRM is an all-in-one system designed to simply dealership processes with lead tracking, inventory management and credit applications. Visit its site to sign up for a demo of its software and learn why it has been voted number one once again for the 2018 Dealers’ Choice Awards. DealerSocket is an automotive CRM designed for either franchise dealerships or independent and BHPH dealers. Its software helps manage internet sales leads but also includes service center functionality like its service scheduler, service recommendations and mobile check-in. This makes it a great tool for dealerships of any size that want to use a single CRM tool featuring automotive-specific integrations for both sales and service. DealerSocket’s pricing is not advertised publicly as it tailors its solution to the needs of an individual dealership. However, it claims to be able to increase your average internet sales by 20 percent and give you the ability to turn vehicles more 35 percent faster with its product, giving you a good potential return on investment. 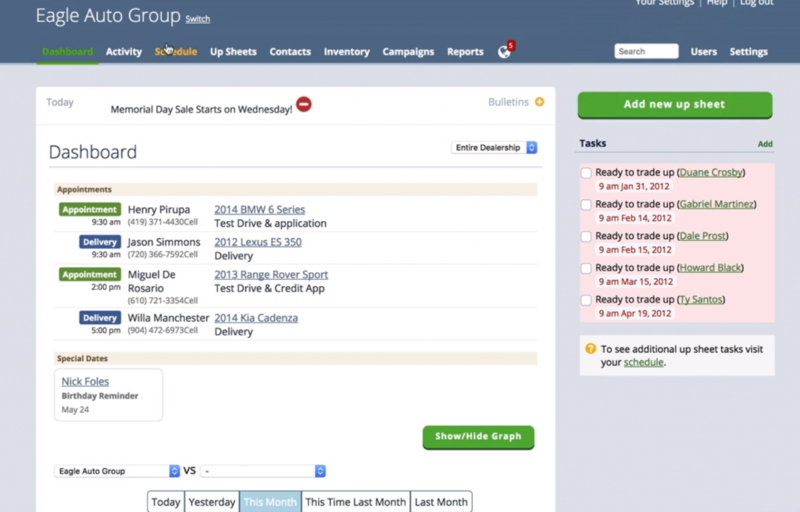 DealerSocket gives users the ability to customize their lead follow-up process. Incoming web and service leads can be routed by vehicle, source or schedule. In addition, the tool can re-assign leads or escalate untouched leads automatically. Its RevenueRadar functionality looks proactively for bank programs like rebates and incentives as well as events like lease over miles and no service in X months, which indicate prospects are in a buying position. 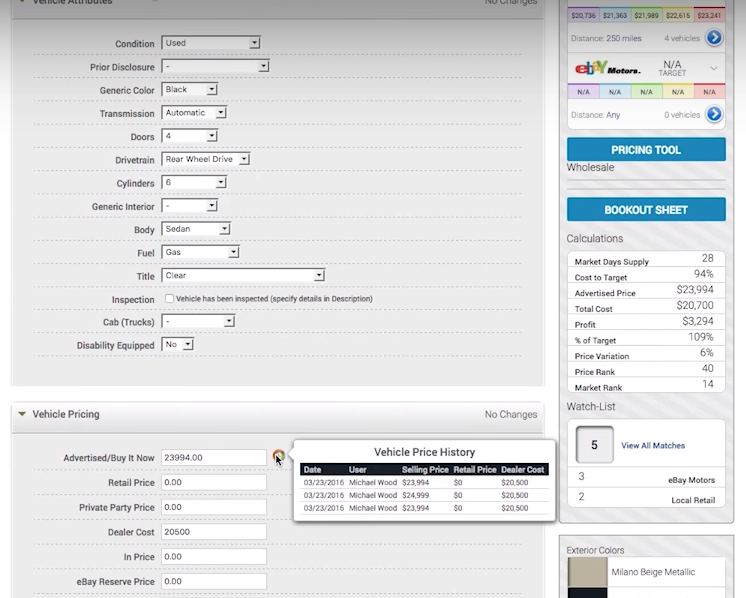 DealerSocket notified users when web leads are received, emails are opened or when prices are reduced. The software includes a centralized dealership performance console, giving management the ability to view website traffic, follow-ups, showroom tracking and other key performance indicators at a glance. It also gives sales management the ability to set quotas and benchmarks or for service teams to see a checklist of vehicle specific service recommendations. DealerSocket offers includes inventory health reporting, lot service photography and can integrate with eBay and Craigslist as well as with iDMS, FEX DMS and Autostar. The tool’s artificial intelligence provides insights as to where a vehicle is most likely to sell profitability at retail while also looking for new car incentives or other rebates. The mobile app is designed to support all essential responsibilities. This includes VIN and driver’s license scan with an automatic update to the CRM and the ability to send e-brochures, browse inventory, text customers and conduct other follow-ups directly from your phone. The mobile app also includes mobile check-in for vehicles requiring service. 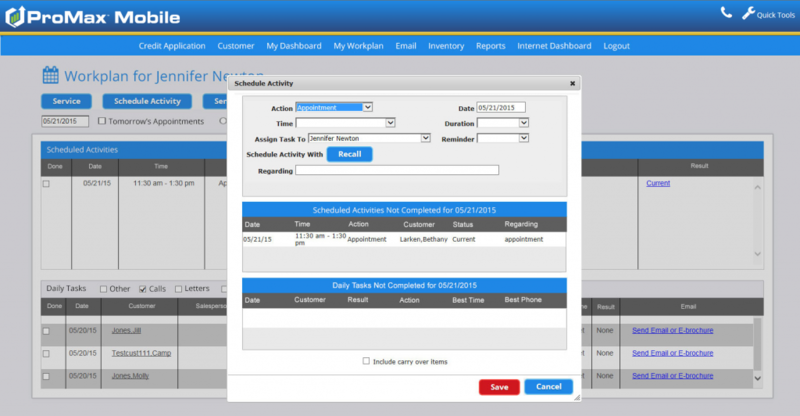 DealerSocket does not include built-in desking tools like ProMax does such as credit reports and insurance forms. However, its integration with iDMS and FED DMS can provide dealerships with a loan-servicing platform even if it is outside of the DealerSocket tool. Users of DealerSocket report the tool requires extensive set up in order to maximize the system’s automation capability. Once set up, they appreciate being able to do pretty much everything within a single product. As the tool is feature-rich, they recommend doing a trial run first as it can be overkill for users who do not need the software’s more robust functionality. DealerSocket has built-in functionality and integrations to help manage dealership of any type and size from lead management to post sales service. You can learn more about DealerSocket by visiting its website and scheduling a demo today. AutoRaptor is a customizable automotive CRM featuring process automation, VIN and license scanning, lead management, mobile access and advanced data mining capability and starts at $299 per month. Users can create customized reports and workflows, search and sort leads by multiple criteria and send bulk text messages. AutoRaptor is best for dealerships that want customizable workflow automation and value data for decision making and targeted messaging. AutoRaptor offers two-tiered pricing plans for small to mid-sized dealerships that cost between $299 and $399 per month and an Enterprise specific plan with pricing and features tailored to specific need. There is a one-time setup fee for $295 for the Starter plan and $595 for the professional plan. 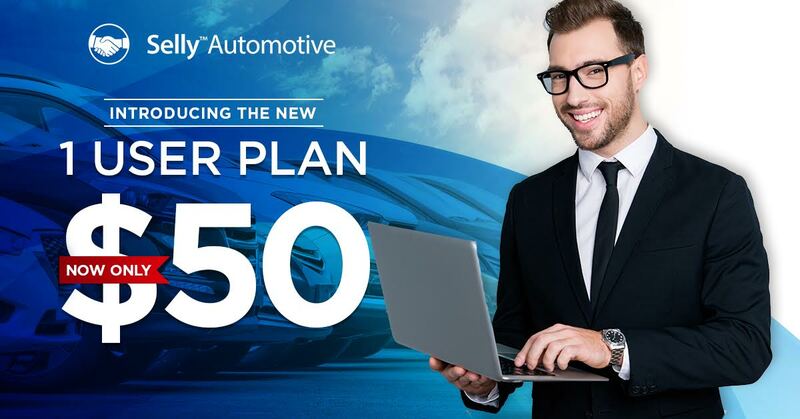 AutoRaptor’s starter plan costs $299 per month and includes up to three users, making significantly more expensive than Selly Automotive, but comes with sales forecasting and sales trend reporting. The Starter plan also features daily work plans, driver’s license and VIN scanning via the mobile app as well as internet lead management. However, this plan does not include DMS sales data integration, an inventory feed or text messaging within the tool. The Starter plan includes email campaigns with custom filtering and location targeting, which is a feature not offered by Selly Automotive, as well as a visual temperature gauge to prioritize follow-up and custom reports. This makes it a great tool for small teams that want to reach out to contacts based on criteria like ZIP codes, incentives or other segmentation targets or dealerships that value data visualization for decision making. The Professional plan costs $399 per month. In addition to supporting six users, the Professional plan offers the same features as the Basic plan but includes built-in telephony. 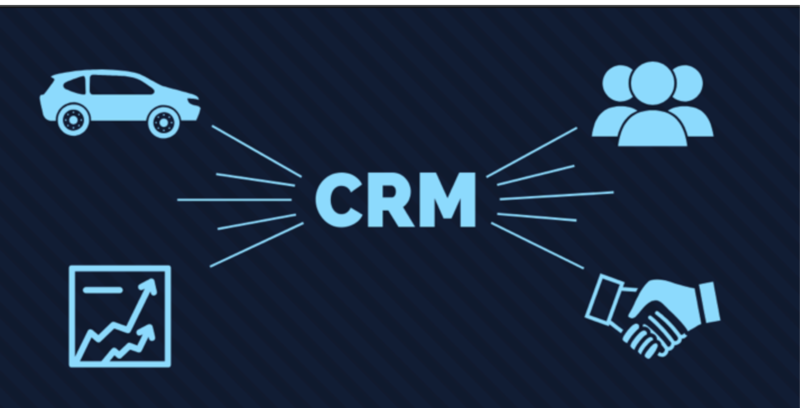 This gives users the ability to send up to 1000 targeted text messages out of the tool using templates that pull data directly from the CRM. The Professional plan also includes an inventory feed and DMS sales data integration. The Professional plan is, therefore, best for larger dealerships that want to send targeted bulk email and text messages. It is also best for dealerships that value data visualization for decision making and want to integrate their system with other DMS tools. AutoRaptor does not include built-in desking like found in ProMax. It’s mobile too also lacks the advanced mobile alerts like found in Selly Automotive and the service center management functionality of DealerSocket. 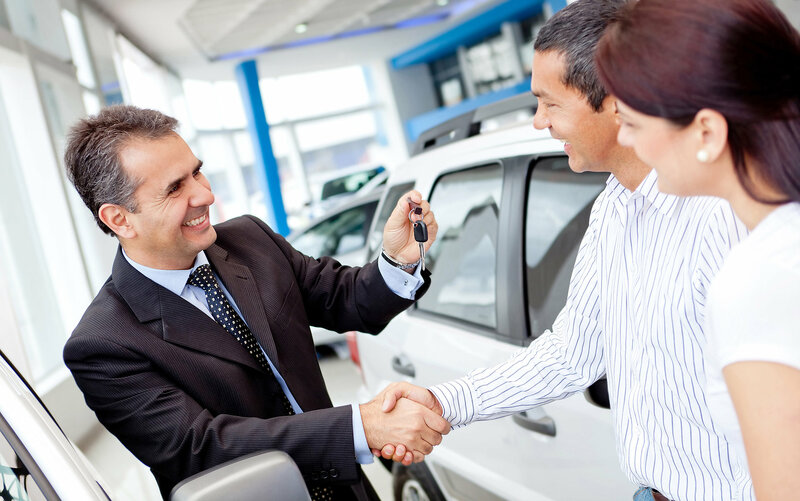 Therefore, AutoRaptor may not suit the needs of dealerships that want to match customers with lenders or those that include service centers. 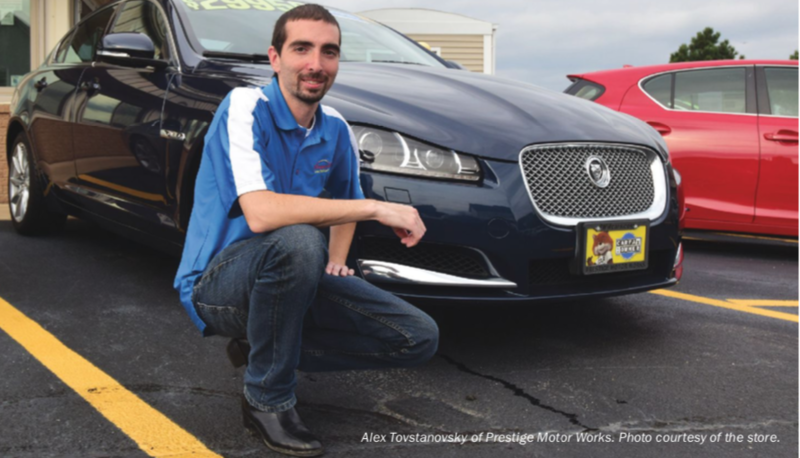 AutoRaptor users say the tool has made it easier for them to keep track of their appointments and follow-ups and monitor the performance of their sales staff. 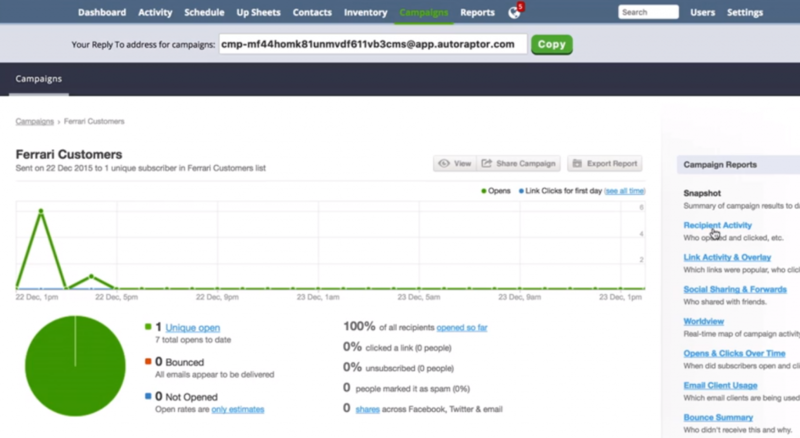 They say the tool is easy to use and were highly complimentary of AutoRaptor’s customer support. AutoRaptor is a competitively priced, automotive-specific CRM that is designed to work with any size dealership with users who, on average, report a 10 percent to 20 percent increase in its sales following implementation. Visit its website to learn more and to schedule your free demo. Dealer Lead Track is a dealership CRM for automotive as well as RV, motorcycle, heavy truck, boat and powersport dealers and starts at $95 per month. It includes specially scripted email templates like warranty and lease-mileage follow-ups to help you sell to existing customers and also comes with lead management, prospect scoring and reminders. It is, therefore, best for dealerships selling more than cars or whose marketing strategy focuses on repeat buyers. Dealer Lead Track costs between $95 and $150 per month depending on the number of initial users and locations. Additional blocks of ten users can be added for an additional $150 per month. Dealer Lead Track’s automated email marketing functionality with 47 standard templates costs $145 per month per location with custom email templates costing extra. 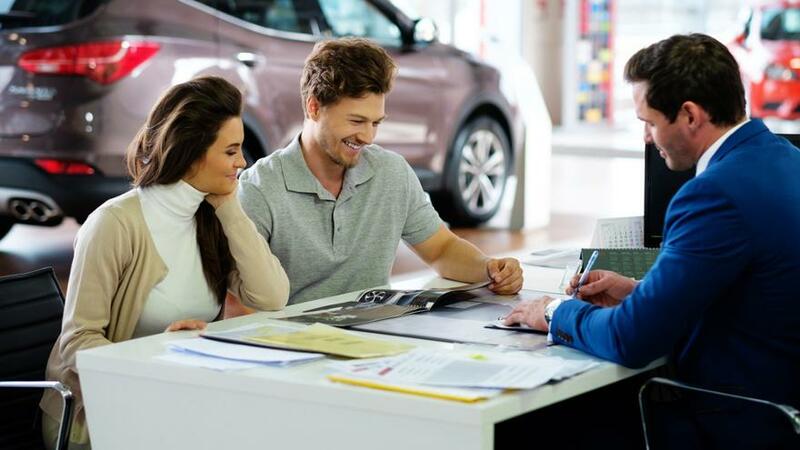 Dealer Lead Track prides itself on its ease of use and features dealership-centric scripted emails designed to follow-up with existing customers based on warranty and leasing schedules. In addition to working with automotive leads, Dealer Lead Track includes additional databases for motorcycles, RVs, boats, over-the-road (OTR) trucks and powersport vehicles, which the other tools lack, making it a good option for multivehicle dealerships. Dealer Lead Track works with 175 lead sources such as CarGurus and Autotrader and offers lead source scoring. It is customizable, giving you the option to assign to a specific manager or by round robin format. Dealer Lead Track also includes scripted emails, written specifically for reconnecting with past customers. Dealer Lead Track sends alerts and notifications such as when a new lead arrives, follow-up reminders and test drive appointments via text message rather than requiring users to log in to the program for their daily work plan. However, the software does include a lead dashboard that sorts leads into categories like hot, out of stock and warranty follow-up and a follow-up calendar reminder tool, which allows users to schedule recurring tasks up to 12 years in the future. 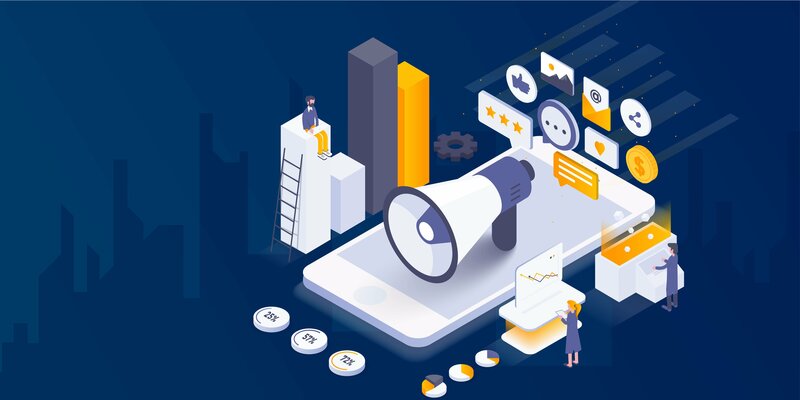 While other tools like ProMax and DealerSocket offer tools for mass marketing email campaigns, Deal Lead Track’s automated and scripted email marketing is focused on reconnecting with prior customers and supports long-term marketing. Its scripts include following up with customers who are nearing the end of their warranty period as well as requests for friendly referrals and can be scheduled out up to 12 years in the future. 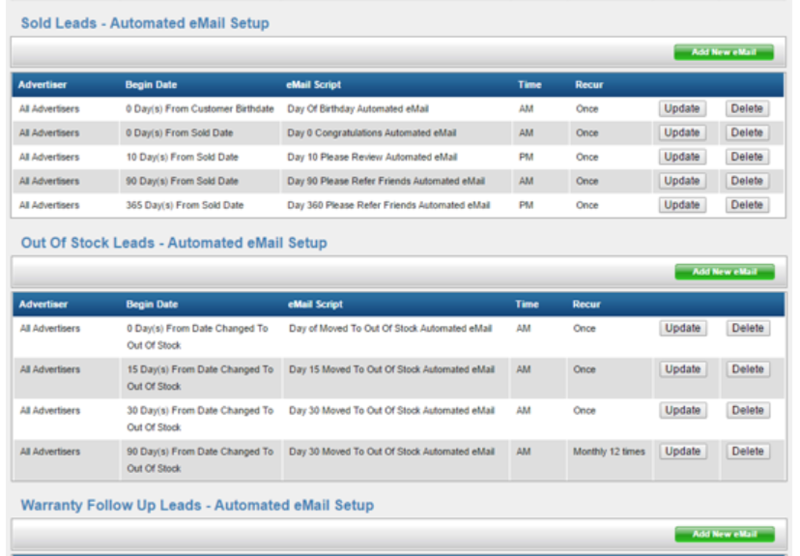 Dealer Lead Track is 100 percent web-based and emails work with Outlook and Gmail. This means you can access the tool and its features on any device provided there is an internet connection. It’s reliance on text messaging for alerts also makes it a good tool for teams that are expected to be selling and following up with prospects on a lot rather than in front of a computer screen. Dealer Lead Track lacks tools like VIN and driver’s license scanning found in the majority of other products we compared like Selly Automotive. It also lacks the more robust artificial intelligence and pricing tools found in ProMax and DealerSocket. Users say that Dealer Lead Track is easy to learn, even for those who aren’t computer savvy. They appreciate that Dealer Lead Track takes care of initial data import at no additional costs and report positive feedback from their customers regarding the tool’s scheduled follow-ups. Dealer Lead Tracks works best with a reliable email provider. Read our article on email providers for our recommendations on the best for small business. Dealer Lead Track is a simple to use CRM that gives users the ability to reconnect to past customers while also including automatic updates from all the best website lead sources available today. You sign up for a free demo or take advantage of its 30-day free trial by visiting its website today. Zoho CRM is a general-use CRM offering lead, deal and task as well as email marketing all from a single system and is free for three users. It also includes social media tracking and voice commands, which are features not offered in many CRMs as well as inventory, purchase orders and invoicing at a fraction of the cost of an automotive-specific CRM. Therefore, Zoho is a robust, low-cost CRM for social selling and general sales management. Zoho includes offers a free plan for up to three users. It’s paid plans start at $12 per month per user to $35 per user per month for its enterprise-level plan. Each paid plan comes with 1GB of storage. Additional storage in 5GB increments can be added for $4 user per month. Zoho’s free version is designed for three or fewer users. While Zoho is not an automotive-specific CRM like the others we compared, it can work with third-party tools like DecodeVIN. Zoho also has web-to-lead forms, integrates with social media, provides a means to sort leads, follow-up tasks and appointments, with automated lead assignment, minor customizations and process automation within a single mobile app. The free version, however, does not offer the invoicing or product management features available with the paid plans. 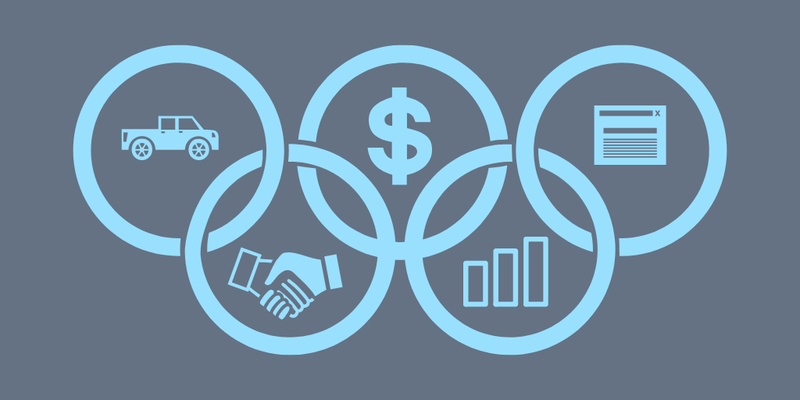 As a result, it is best for dealerships that are looking for a low-cost CRM to manage leads and tasks but use a different system to manage inventory and accounting. At $12 per user per month, the Standard plan gives you the same lead and prospect management tools as the found in the free plan as well as more custom field options. It also gives you access to sales and marketing tools, more email templates and bulk emails a day per user, as well as website visitor tracking. However, it lacks the built-in quotation and case management or service ticketing, tools found in the Professional plan. The Standard plan is best for dealerships with more than three users that utilize social media as a part of their marketing strategy and don’t have a service department and utilize a separate financing and invoicing program. It includes multiple performance dashboards. Therefore, it is also a good plan for sales managers who want to manage their team member’s performance as well as their leads and follow-up activities. At $20 per user per month, the Professional plan gives you the same lead management features as the lower-tiered plans but offers even more custom fields, email templates and daily bulk emails. Leads can be captured directly from social media interactions and customers can request service appointments directly through web-to-case forms. The Professional plan also gives you the ability to set alerts for follow-up based on events you specify. The Professional plan provides lead management, service management, advanced social media integration and email marketing automation. For this reason, it is a good solution for dealerships that want to combine sales, service and marketing contacts all on the same CRM. The Enterprise plan is like adding a full-time sales assistant and analyst to your team and costs $35 per user per month. Its Zia Voice feature gives you the ability to add and manage your contacts and leads using voice commands. It adds additional analytics like best time to call insights and anomaly detectors, which can help you connect with your contacts more often and can alert you to potential issues with your contacts before they happen. The Enterprise plan is a good solution for teams that want additional insights into their leads which can help improve conversion rates. The plan is also good for teams that want to be able to manage their leads, deals, marketing or service orders using voice commands. Zoho CRM is a general-use CRM and does have standard integration with DMS products or tools like built-in VIN and driver’s license scanner. However, its available field customizations and developer tools make it so you can use the lite version of the Selly Automotive Mobile App with Zoho or otherwise adapt Zoho to your dealerships unique needs rather than requiring your dealership to adapt its processes to a CRM. Users of Zoho report that they like the integrations Zoho offers with other business applications as well as its ability to streamline processes like billing. However, the tool is not without complaints. In particular, reviewers expressed frustration with Zoho’s customer service response times. You can read more on our Zoho review page. 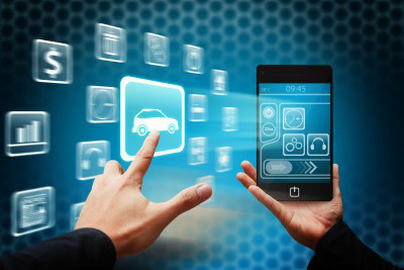 Car deal software like CRMs or internet lead management (ILM), help manage leads, daily work plans and follow-up tasks. We believe that Selly Automotive is the best car dealer software for internet lead management and sales productivity with a great mobile user interface and automotive dealer-specific integrations and functionality. However, Selly Automotive lacks features like desking or service management, so there may be better tools for your specific dealership. Zoho is a great low-cost, full-featured CRM that you can customize to fit your individual needs and sales process, which also comes with developer tools and access to a marketplace of third-party integrations. Zoho gives you the ability to combine multiple business functions in a single tool. Best of all, it is free for up to three users.